Give your children a fun, truth filled Easter interaction with the Gospel of Christ; with Resurrection Eggs. 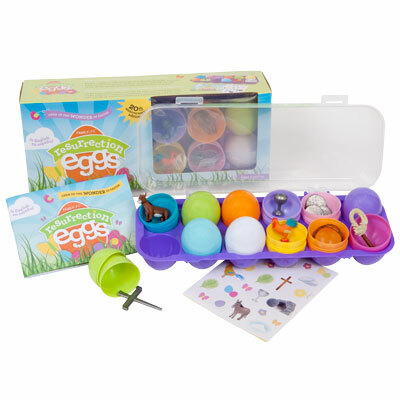 Resurrection Eggs provides a fun and engaging way to share the story of Easter with all the children in your life. Whether at home, Sunday school class, children’s ministry or more. As you read about Jesus’ great gift to us, your children can open the eggs to find symbols inside giving them the opportunity interact with a piece of the story. Want to host a neighborhood Resurrection Eggs Easter egg hunt? Or maybe you just want some extra Easter activities and coloring pages to share with your children or Sunday school class? Download the Resurrection Eggs printable activity pack in English or Spanish! Booklet Full color, saddle-stitched paperback, 4.25" x 6"